California EV drivers will be seeing more highway-adjacent fast charger stations later next year as Electrify America begins its second round of work. The stations will extend EA’s network into Riverside and San Bernardino counties in Southern California, the Santa Cruz-Watsonville area on the coast below San Francisco and Santa Rosa in the wine country north of San Francisco. They are part of a $200 million, 30-month “Cycle 2” California ZEV investment proposal by Electrify America. The company is a nonprofit set up by Volkswagen AG as part of the multi-billion settlement it agreed to after being caught fiddling its diesel vehicles’ emissions control software to illegally pass strict state and federal emissions standards. The Southern California fast charger stations will help ease the road for EV drivers to make trips form the coast to Las Vegas, the local mountain resort areas and popular Colorado River vacation and recreational areas. Existing and proposed fast charger stations for first half of Electrify America’s 10-year, $800 million California investment plan. The other locations will facilitate trips along the coast and into the Northern California wine regions. Construction is to begin in July 2019. the plan still must be approved by state air quality regulators. 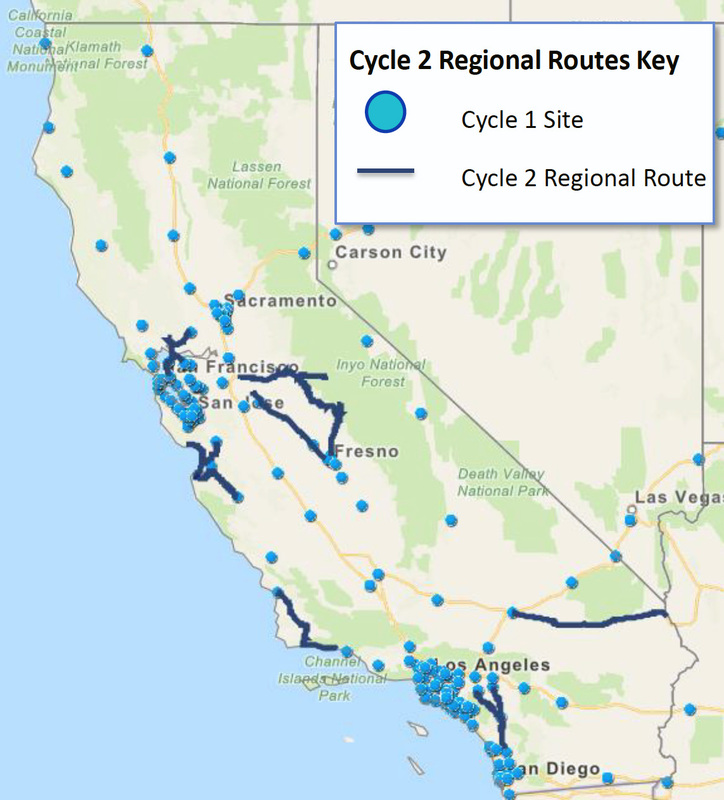 In addition to the three new Cycle 2 territories, Electrify America will continue building up its California fast charger network in the initial Cycle 1 metro areas: San Diego-Carlsbad; Los Angeles-Long Beach-Anaheim; Fresno; San Jose-Sunnyvale-Santa Clara; San Francisco-Oakland-Hayward, and Sacramento-Roseville-Arden-Arcade. The Electrify America investments also will include installation of Level 2 – 240-volt – convenience chargers in retail and residential locations throughout the state, as well as funding for electrified vehicle awareness advertising programs. The VW diesel settlement included agreement for the automaker to spend $2 billion in the U.S. on EV charging infrastructure and electrified vehicle education and access programs. The funding is to be spent over a period of 10 years, divided into four 30-month cycles. VW set up Electrify America to handle the spending. Of the total, $800 million – 40 percent – is earmarked for California, the nation’s largest EV market.